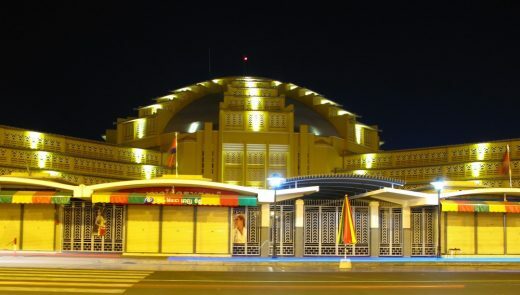 After an intensive rehabilitation of its emblematic architecture the Central Market in Phnom Penh was reopened on May 25th, 2011. 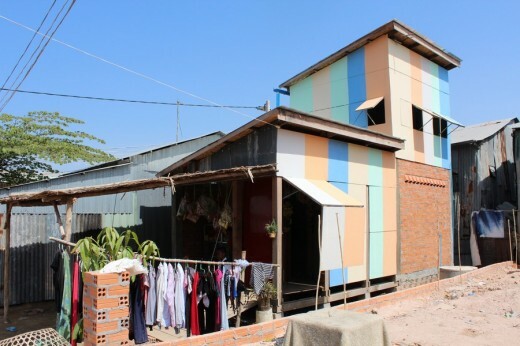 The team, competition winner in 2005, consists of Villa Park (a Franco-Cambodian construction company) and the French international architecture Agency Arte Charpentier Architectes represented on site by His Excellency Vann Molyvann, who brought to the team all his experience and knowledge of Phnom Penh. The project is also the result of a consultation with the municipality assisted by the consulting firm Kosan and experts from the City of Paris. 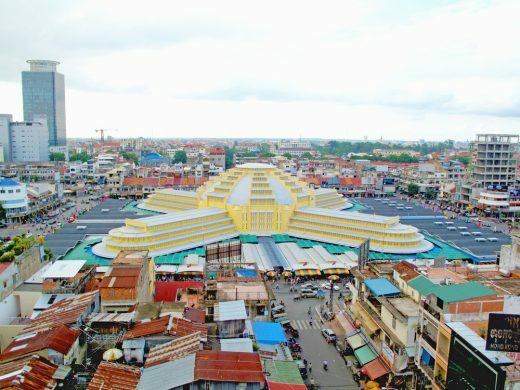 The Central Market in Phnom Penh is a remarkable monument, not only because of its architecture but also by its influence on the shape of urban space. 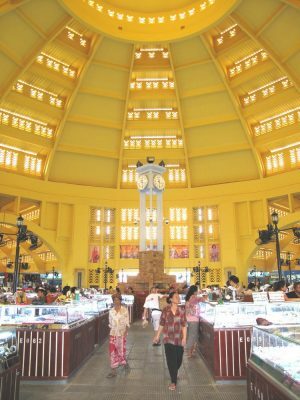 Inaugurated in 1937, nearly seventy years ago, it still remains an architectural model for the covered markets. 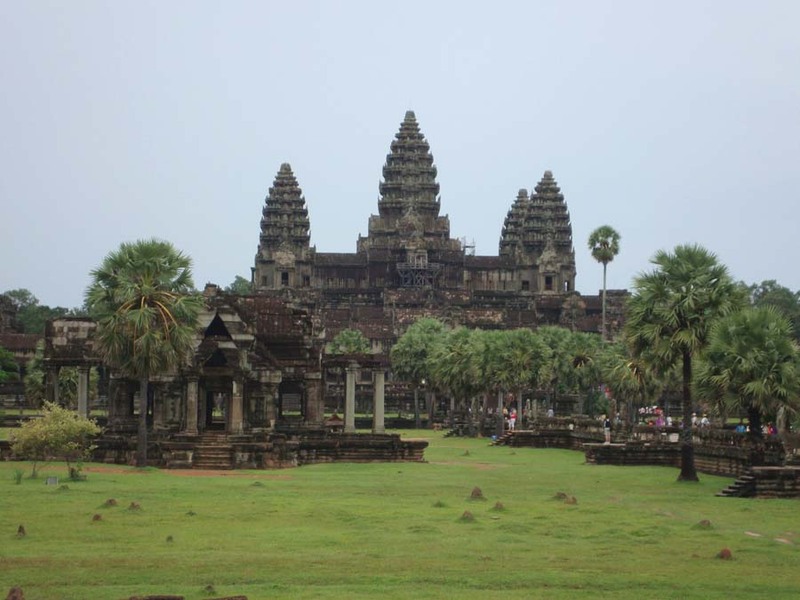 Despite its age and low maintenance due to lack of resources, this structure had retained all its functional qualities. Although the thermal comfort and ventilation were affected by the high density of booths set up around the building, it turned out to be always effective. – Maintain all merchants on the site. The reconciliation of the market with its environment required a reorganization of its surroundings in order to provide better continuity of pedestrian traffic. 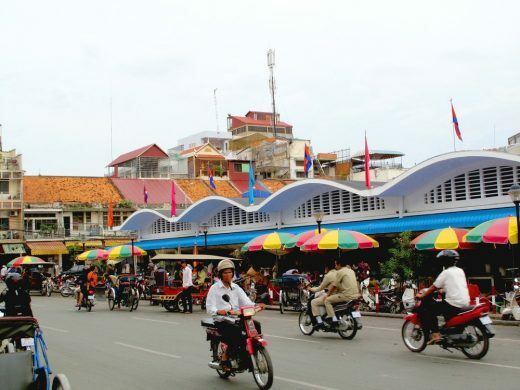 This was completed in cohesion with the local transport plan for the center of Phnom Penh developed by the municipality. This work was made with the support of experts of the City of Paris. 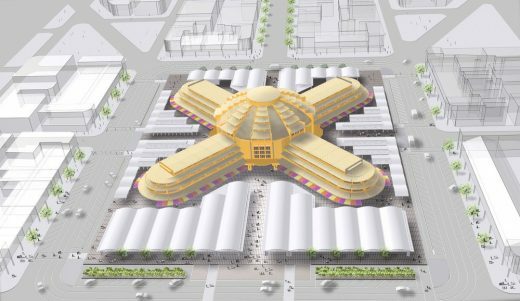 Parking spaces and drop-off areas are now clearly defined and allow easy access to the market without being a nuisance to pedestrian traffic. The streamlining effort has also focused on the organization of the market itself. 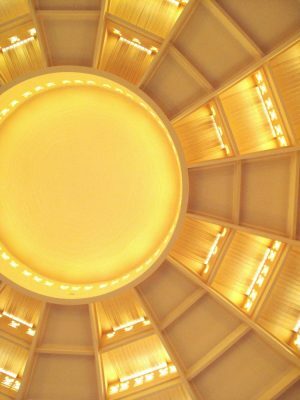 Four wide open lanes lead to the central dome of the market which is thus emphasized. Inside the market, the project offers fluid circulation from the street to the historic building. 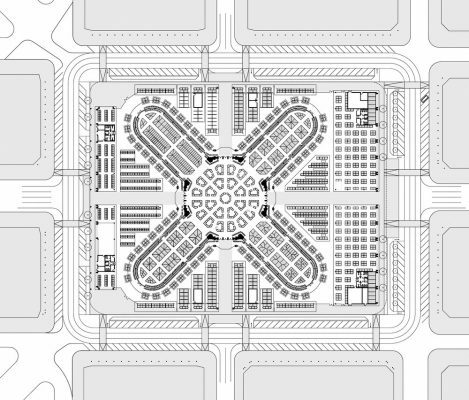 To meet the merchants needs, extensions are implanted, they are independent from the historic building on the east and west squares of the Central Market. 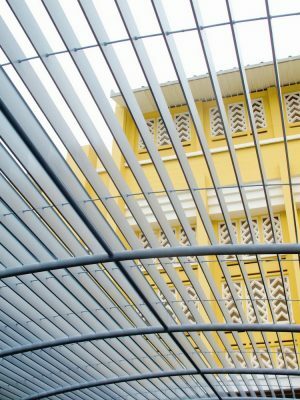 These new structures are designed to provide a modern and functional protection to merchants and passers-by while respecting the architecture of the traditional market. 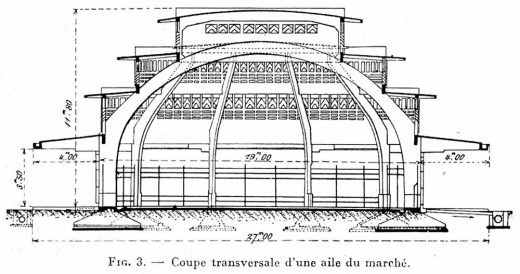 The same architectural design is reproduced on the north and south squares with extensions incorporating smaller gauge of existing houses to be retrofitted. 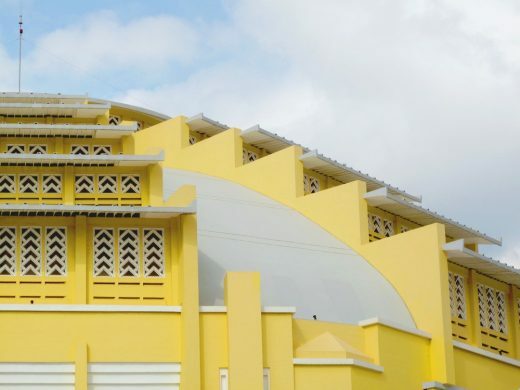 These buildings also house the premises of services dedicated to the proper functionning of the market (offices, toilets, waste management …). 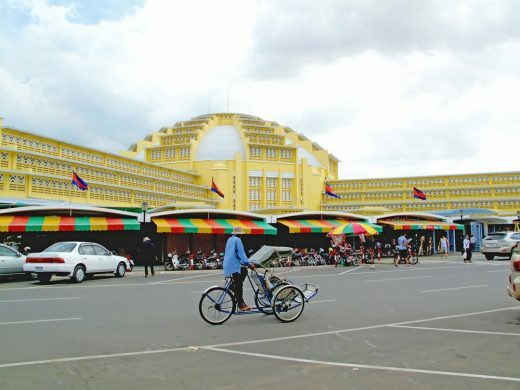 The architectural integration of this new market is in compliance with the general composition of Psar Thmey (Cambodian term for Central Market). These halls around the market restore a new urban uniform façade, which consists of a succession of arcades overlooking wider sidewalks and allowing commercial animation on the outside. This circular walkway thus becomes a trading area opened out into the city. 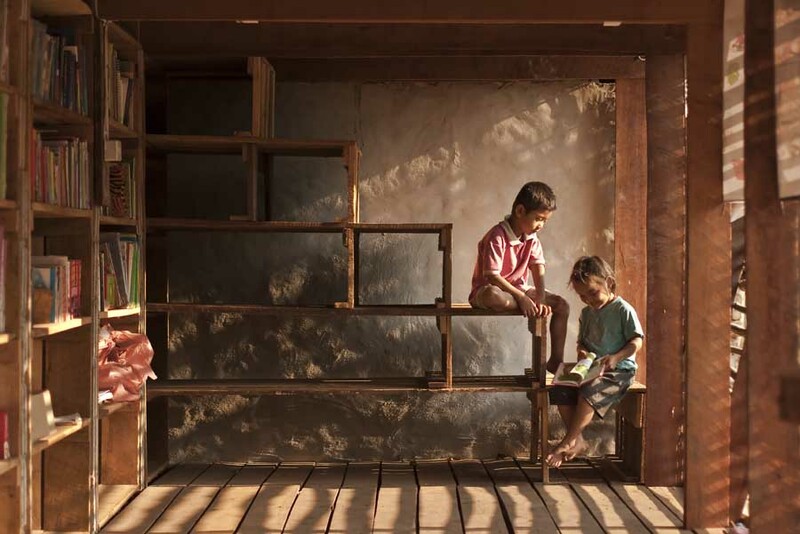 The project was nominated for the French award «Grand Prix de l’AFEX 2012». Arte Charpentier Architectes, present in China for over fifteen years, has become famous with emblematic buildings such as the Shanghai Grand Theater, the Nanjing Road, the Century Avenue, the Luwan District, Celebrations Plaza (Expo 2010) and the Fashion Center, delivered in 2011, redeveloping of a large industrial site; or, in other provinces such as Xinjiang with the Ala’Er Museum. Arte Charpentier Architectes has also desig- ned buildings in China for French companies, such as the Saint-Gobain R&D Center and the certified Golden LEED L’Oreal R&D Center.